Ozzy Blackbeard: Tilly's Picnic Blanket Skirt x 2! 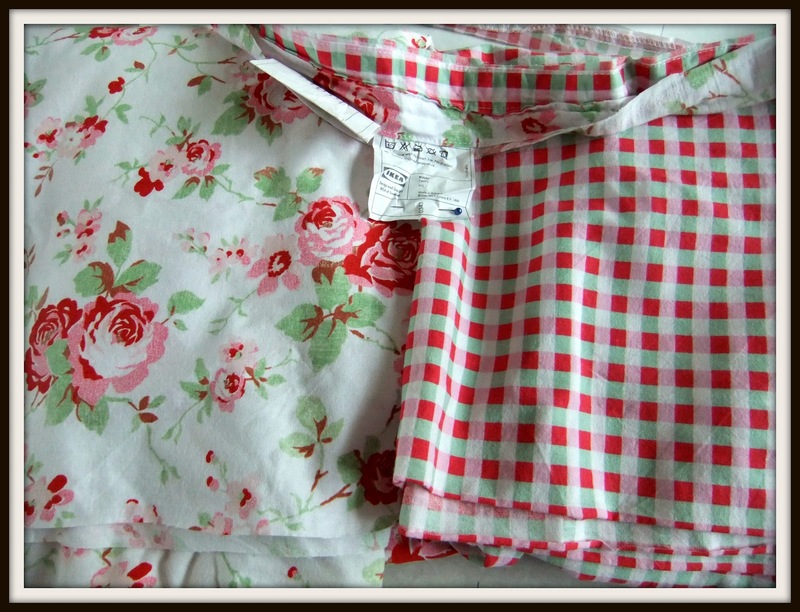 Tilly's Picnic Blanket Skirt x 2! I've made not one, but two of these!! It's Tilly's Picnic Blanket Skirt. Some more lovely examples can be seen here. 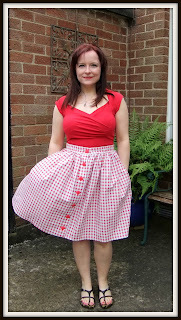 The gingham one below is for me, (there was a gust of wind when Mr BB took this photo!). I'm wearing mine as I type, because, unbelievably, it is actually sunny! And this flowery version is for my sister. It was only fair that she got one as she gave me the fabric! 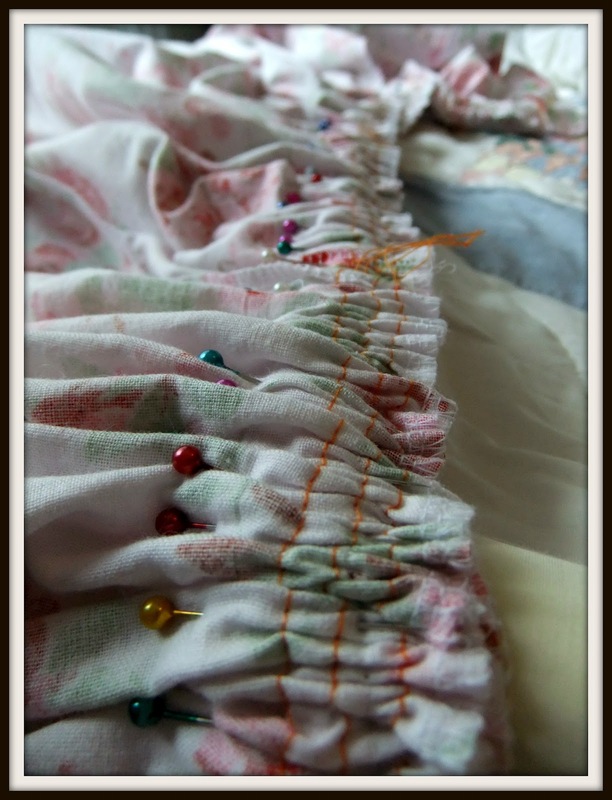 I had asked her to keep me any old duvet covers that she might throw out so I could use them for toiles. This was a duvet cover from Ikea, one side was gingham, and the other side was flowery. Here's a photo taken after I started to cut it up. These were really easy to make. The instructions are so easy to follow, and I especially liked how it shows the maths working out. I particulary like Tilly's instructions for doing gathers (I think they are in part 2), I'll be doing gathers like this from now on. This was my first go at buttonholes on a real live garment, and that buttonhole foot on my machine is brilliant. The only thing I changed was attaching the waistband. I overlocked the bottom edge, and sewed it to the top edge of the skirt. I used two rows of stitching to make it secure. 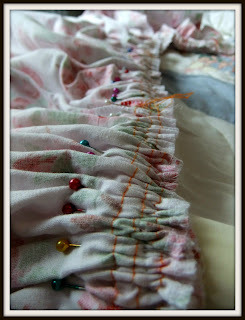 Below is a photo of the skirt attached to the waistband before stitching. The waistband is underneath. I cannot express how many pins are required for this! Make life easy for yourself and use every pin you own!! My sister said to post that she loves her skirt and also her hat, and she promises not to lose this one! Thank you! Aren't those seam allowance rulers great?! I've had mine for one week now, and don't know what I did without it! 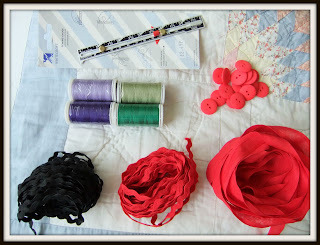 Your sewing is just amazing! I can't believe that one of the skirts is a recycled duvet!! I love that you got both skirts out of one duvet! I also like the picture of your notions at the end of the post. The trims look like flowers. Thank you! It hadn't occurred to me that the trims looked like flowers, and you say, they do! I had just wrapped them around my hand to make them look tidy. Love your skirts - they turned out beautiful! And I recognise that duvet - I snatched that up from Ikea during a sale and made loads of bunting out of it!!! And omg, I have been really behind on my blog reading so I hadn't seen that you mentioned about a new sewing shop in Belfast! How have I not known about this!!!! I'm off to investigate after work tonight for sure!!! !